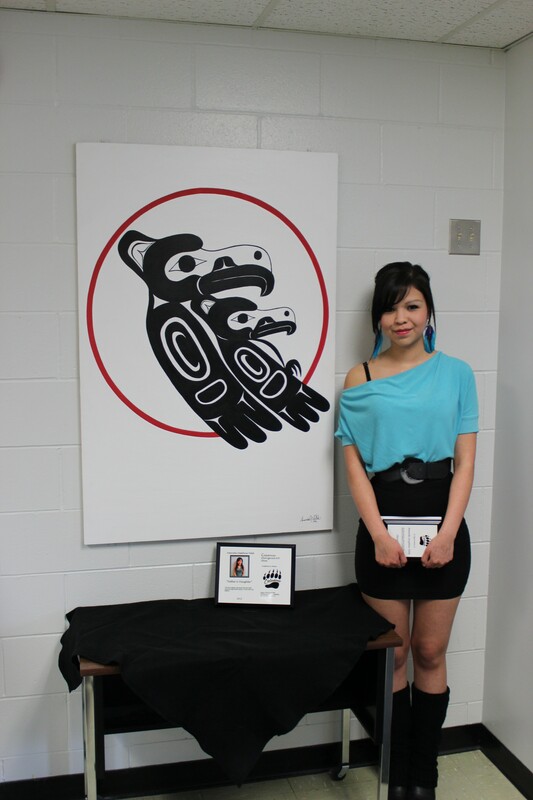 A special evening celebration to acknowledge the artists and cultural significance was held May 31. 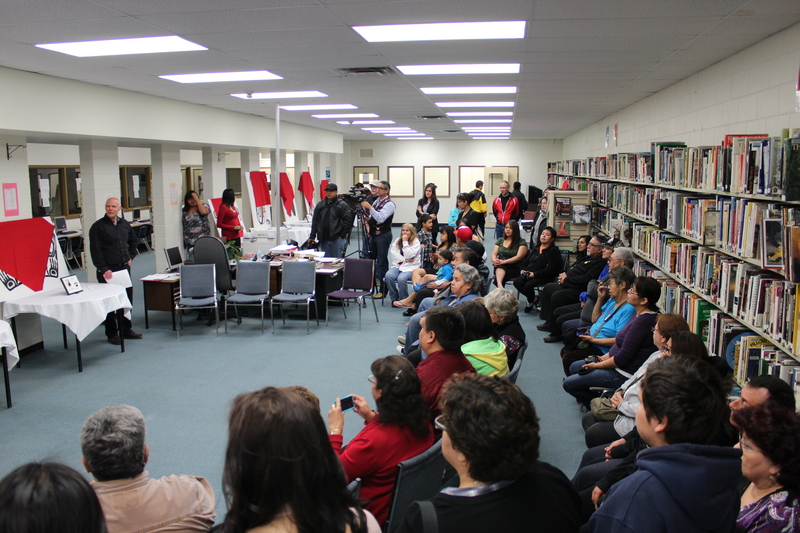 An overflow crowd of family, friends, staff and community members gathered in Caledonia School Library where they were officially welcomed to the ceremony by Ms. Charlotte Guno on behalf of the Kitsumkalum Band whose traditional lands the school is situated. 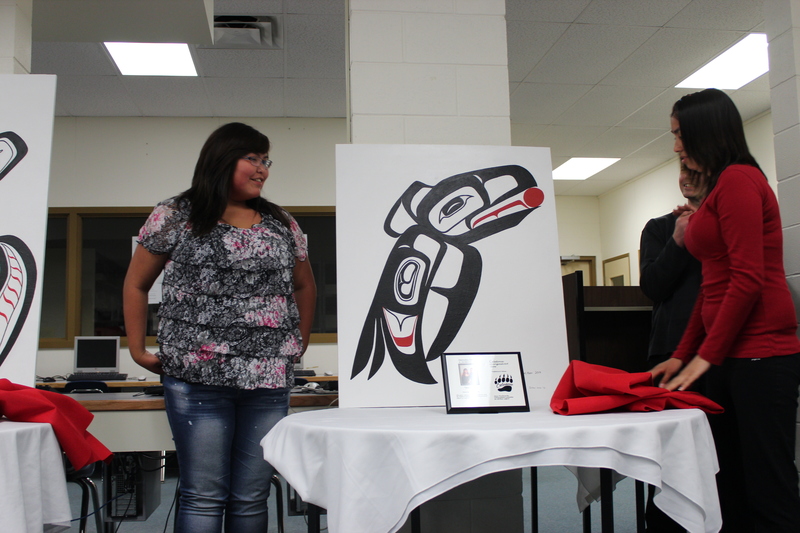 The welcome was followed by the blessing of the event by Ms. Debbie Moore on behalf the Kitselas Band. Principal , Cam MacKay, Principal of Caledonia, acted as Master of Ceremony for the evening. 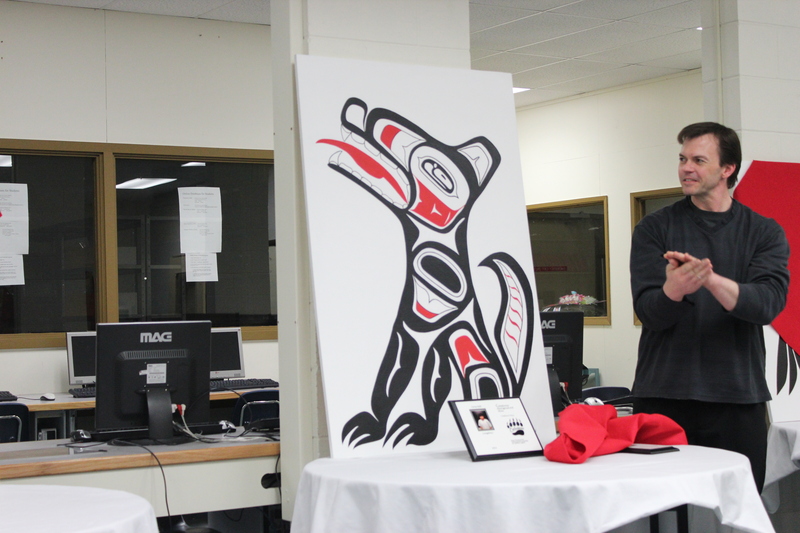 Mr. MacKay addressed the artists and guests, and commended them for their diligence and skill, but more importantly, he praised them for sharing their spirit and gift with the school and community as they leave a lasting legacy for all to admire. “Not only should you be very proud of your accomplishment, but also what you have done to inspire peers, community, and future students of Caledonia”. Upon entering the front entrance of the school guests eyes fixated on the inspiring site of two 4’x6′ iconic pieces of art designed by CJ Bennett-Nabess (assisted by Brandon Williams). 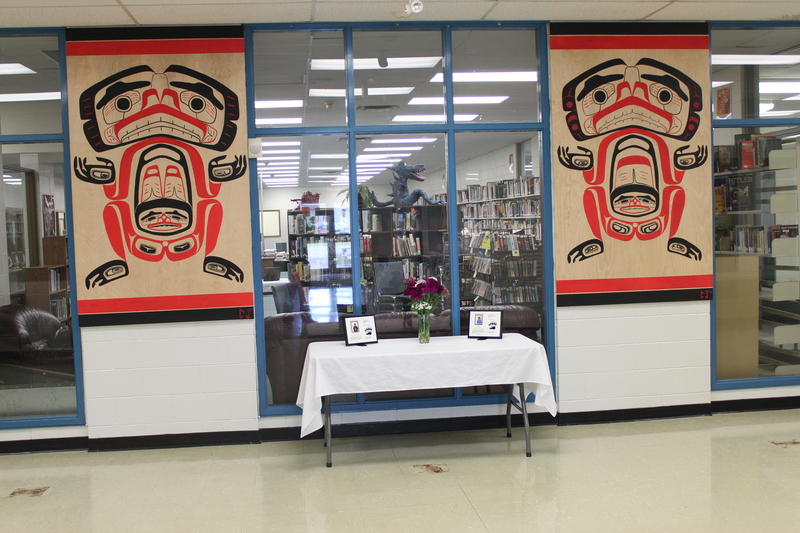 To the left, in the main office, was another 4’x4′ masterpiece created by Kaela Moldenhauer and to the right another stellar piece created by Amanda Telek. 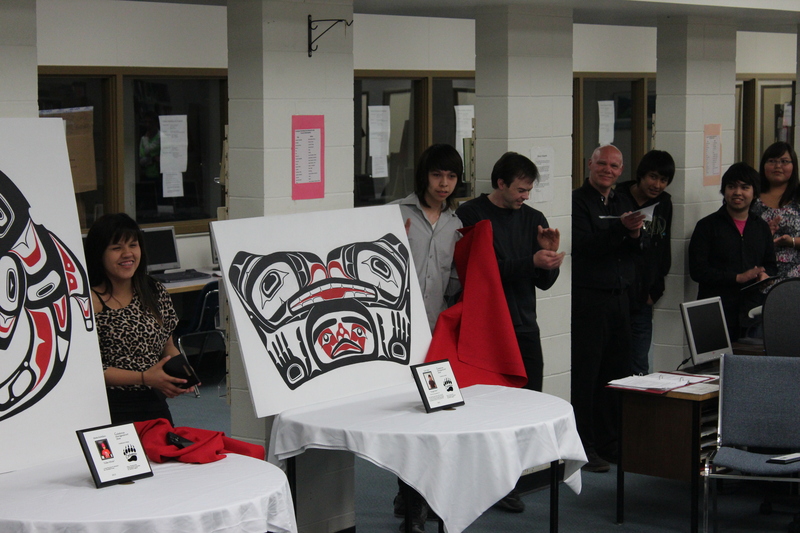 The look said it all, it was going to be an awe-inspiring evening for the students, school and community. The 9 remaining artworks were covered in the Library awaiting to be unveiled one by one as tribute was paid to the artists. 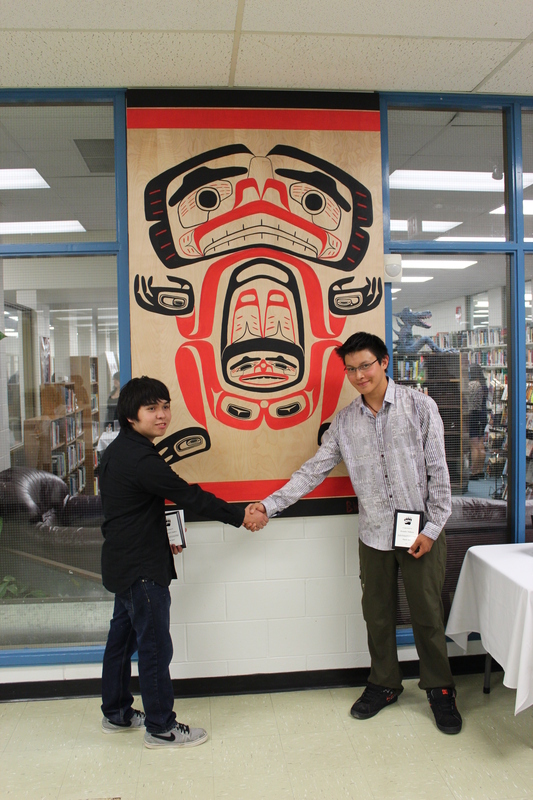 Each artist was given a plaque to take home as a commemoration of the night and their work of art. Along with the art work, a small plaque with the artists picture and description of their art will be mounted on the wall beside their pieces of art. Each of the artists also did a piece of writing that went along with their artwork. The writing was a reflection of their inspiration for their art. A common theme regarding inspiration was family. 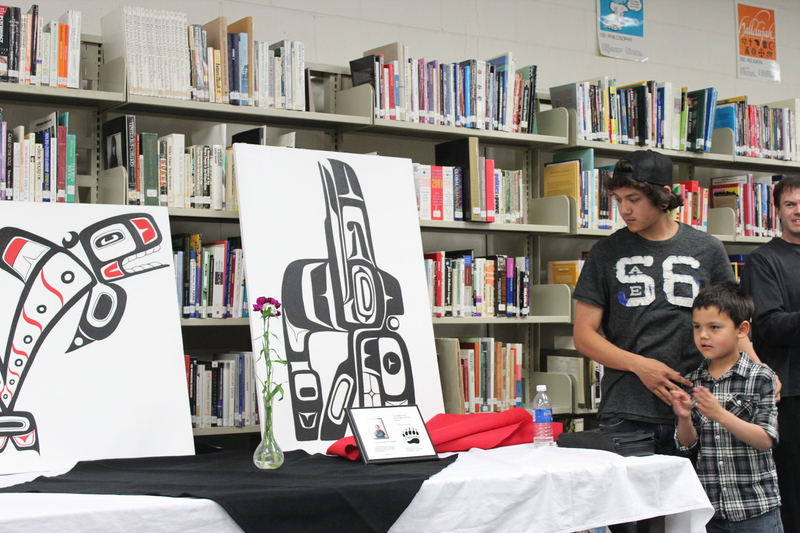 The project was an idea brought forth three years ago by Principal MacKay but it needed some support with materials and expertise. “The project would not have been possible without the support of the Terrace 131 Committee who provided all the funding for the material and resources for works of art and the celebratory evening. It also would not have been possible without the mentorship and expertise of teacher, Mr. Marc Eliuk who was the artistic catalyst needed to pull the project together. 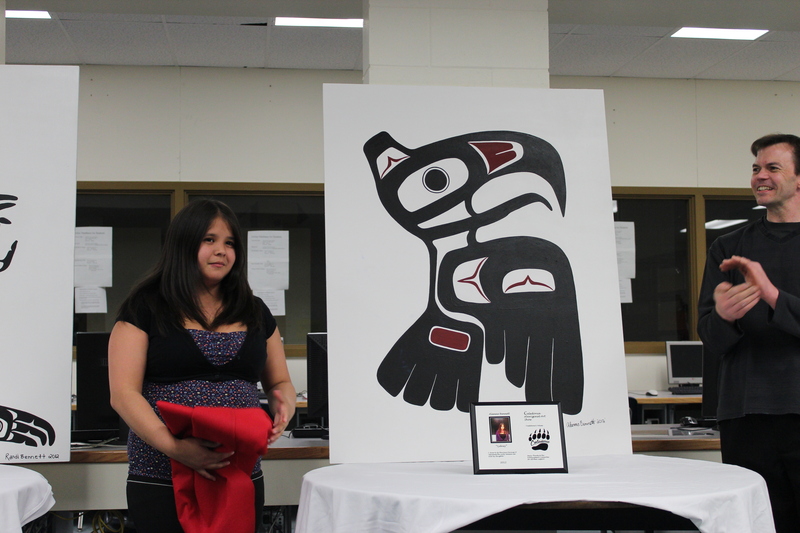 Kermode Success Program teacher Ms.TammyBraid; Rehab worker – Ms. Sheila Denomme; and First Nation Support Workers Dylan Freethy and Deborah Bulleid not only supported the students throughout the project but arranged the program for the evening. 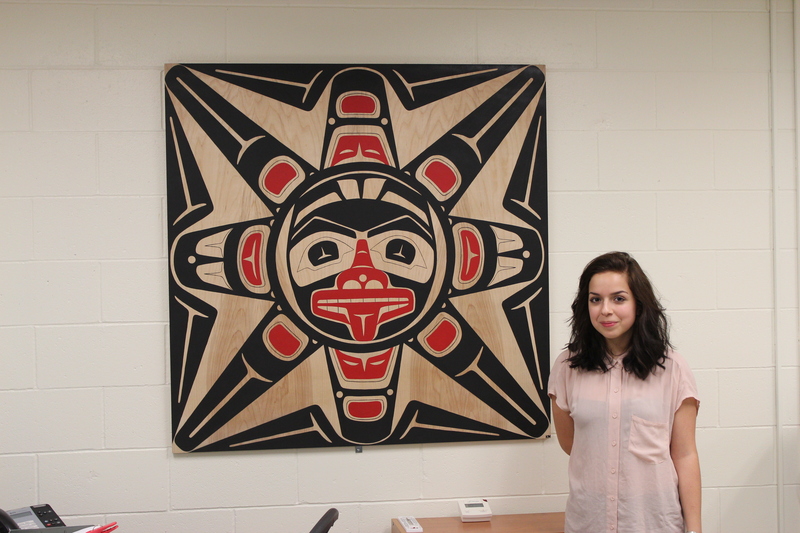 Amanda Telek with her work of art which is situated outside the main office. 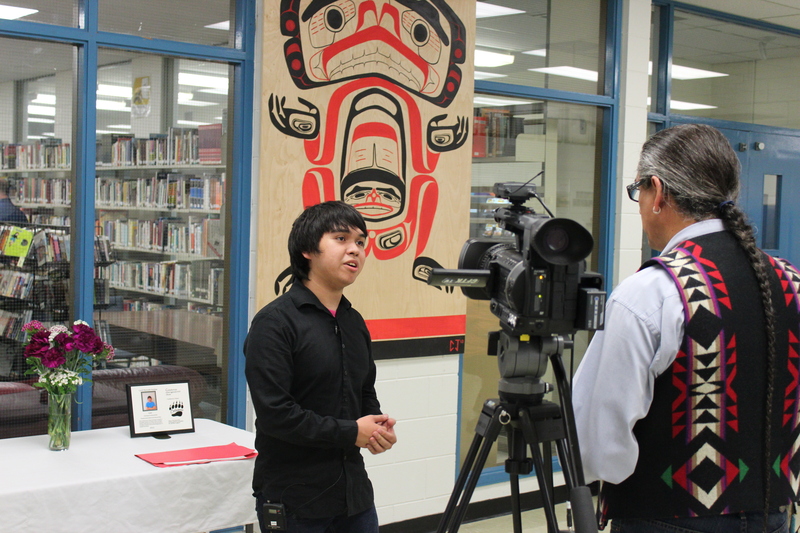 CJ Bennet-Nabess being interviewed by Robert Pictou who produces "The Journey" local TV Documentary. Mr. Eliuk showing off Corey Bell's creation. 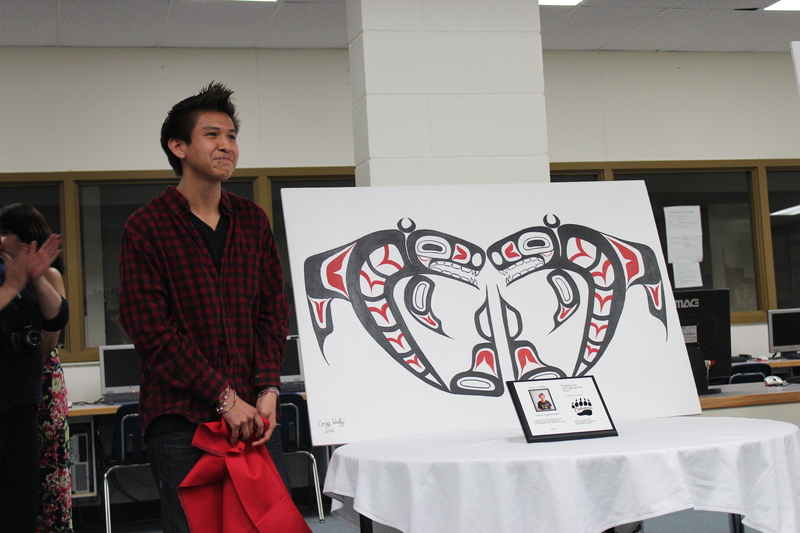 Kane Wesley unveils his creation. Mercedes Abou and Jorden Louie show the crowd they're art. Kyle Tallio with his creation. CJ Bennett-Nabess and Brandon Williams congratulate each other on their work. Cory Wesley unveils his masterpiece. 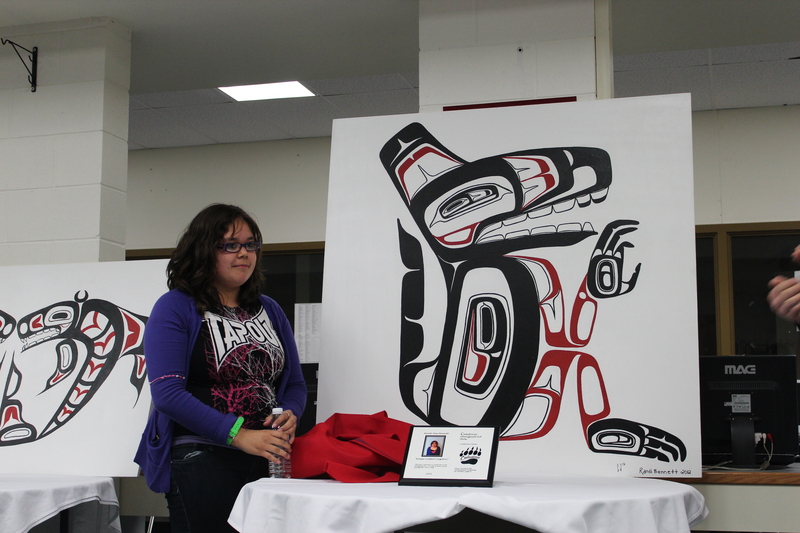 Randi Bennett with her creation.